This year, Scientific Games’ “Hot Shot Casino” slots game and Playtika’s “Vegas Downtown Slots” made Facebook’s 2015 web games of the year list. 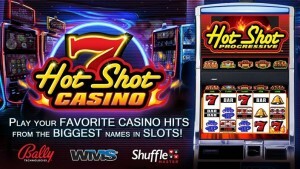 “Hot Shot Casino,” a game that was developed by Scientific Games’ SG Interactive Division, is a game that emulates real-world slot machines, but in a free to play version. Scientific Games is also at the forefront of creating new skill-based slot machines for casinos. These new machines are believed to be the future of casino slots. The hope is that the interactive slot machines should bring more millennials into casinos than ever before. The company has had clear success across Facebook, one of the most popular social media outlets around, and they believe that this success will be equally as viable in real casinos. The biggest downtown slots game, which is owned by Playtika of Caesars Interactive Entertainment, is a joint venture between Caesar’s acquisition company and Caesars Entertainment Corporation. This game presents virtual versions of the classic reel-driven Las Vegas slots machines. Facebook representatives say that more than 450 million people play games or connect to games on their site. With slots games placing in the 15 most popular web games, right alongside popular games such as Yahtzee, Family Guy, and Best Friends, slots games are becoming more popular across the world. Michael Quartieri, the new head of scientific games, previously served nine years with Las Vegas Sands Corporation, ending his time as senior vice president and chief accounting officer. With Quartieri at its head, Scientific Games believes it is in prime position to impact the global gaming economy. Scott Schweinfurst, the previous company CEO, is due to retire at the end of the year. His final act with scientific Games was to acquire Bailey technologies in a $5.1 billion deal near the end of 2014.